Old-Time Fiddling and Clawhammer Banjo Picking by Two of the Greats! Ken Perlman and fiddler Alan Jabbour present a program of Appalachian tunes, featuring most prominently the music Alan learned in the 1960s from his mentor, West Virginia fiddler Henry Reed. Stories that evoke the lives and cultural milieu of Reed and his contemporaries add an extra dimension to the presentation. Alan and Ken have redefined that great American invention, the fiddle-banjo duet, and brought it to new heights of complexity. Alan’s powerful fiddling style, with its syncopated bowing patterns and lyrical texture, is offset perfectly by Ken’s inspired approach to clawhammer banjo, which explores chord inversions, harmony lines, voice leading, note-for-note playing, and counter-melody. Their performances testify to the grace, beauty, and power of Appalachian music. 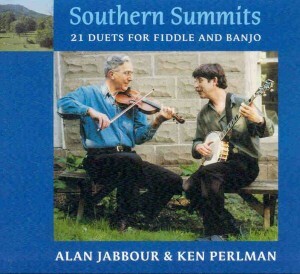 Check out Ken & Alan’s joint CD, Southern Summits: 21 Duets for Fiddle and Banjo. Click here for reviewers’ comments. Ken and Alan have toured together in Britain, Ireland, continental Europe, Canada, and much of the United States. They have also served on the faculty of more than a score of prestigious music camps and teaching festivals, including Augusta Heritage Workshop, Banjo Camp North, Common Ground on the Hill, Festival of American Fiddle Tunes, Midwest Banjo Camp, Northeast Heritage Music Camp, the Puget Sound Guitar Workshop, Rocky Mountain Fiddle Camp, Swannanoa Gathering, and the Tennessee Banjo Institute. Programs. They play concerts, dances, and teach workshops on banjo, fiddle and old-time music history. They also teach a class called “The Fiddle & Banjo Team,” in which students study new skills on their own instruments, then learn how to function in this most fundamental of old-time music ensembles.